The STOP Campaign that didn’t get strangled at birth! The new Stop Taking Our Past campaign (see here) couldn’t be more beneficial as it simply asks farmers to ensure all detecting finds get reported. Yet the only reaction we’ve had from detectorists is opposition. In fact, the owner of the premier detecting forum even wrote to the CBA, English Heritage and the Government trying to get them to distance themselves from it. Predictably he failed. The Chairman of CBA told him “I support the point they are making” and English Heritage told him “We advocate responsible detecting & reporting of all finds” (which of course is the precise aim of the nSTOP campaign!). The Government is yet to respond but it’s inconceivable they’ll say anything different as they spend millions providing a recording scheme. So it’s now beyond argument, nSTOP is not at odds with official opinion, it equates with it so it can’t be belittled or ignored and we have every right to push ahead with it as it’s good for archaeology, archaeologists, landowners and the public. Unlike the original STOP campaign it’s not going away so hopefully every landowner in Britain will hear about it. We’d really appreciate some help though. 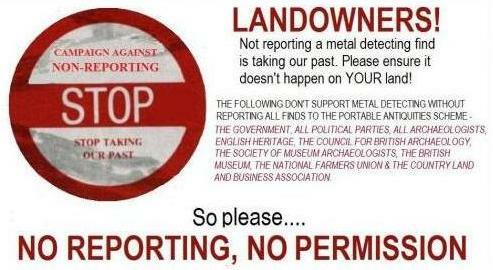 So as we said before, if you’re a history lover, archaeologist or ethical detectorist please spread the message – “No reporting – No permission”. Why wouldn’t you? How will the PAS be able to cope with recording ALL finds? – They simply couldn’t. There needs to be a clearer definition of what should be recorded and what is not necessary to record otherwise the system will just collapse under the strain of recording items with no real historical value to them. Are they supposed to record Victorian finds? Thus the Campaign can’t be dismissed on the grounds PAS couldn’t cope if it was successful. Incidentally, PAS has been trying to increase reporting for 14 years. It would be strange if they now said they couldn’t cope with more – or it was said for them!